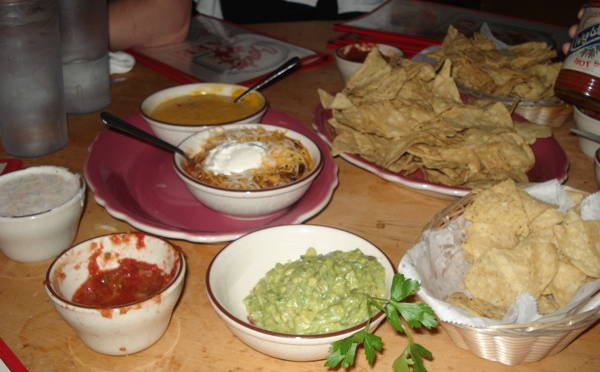 If Nacho Patrol has a second home, it has to be around one of the giant tables of Border Cafe in Harvard Square. With the amount of money we have spent on their delicious margaritas we could pay off the national debt. The sheer quantity of chips and ranch sauce we’ve eaten could feed a large third world nation for five to eight years. Sure, the food won’t blow your mind, but the atmosphere and the friendly staff goes a long way in making this one of our go-to Boston area eateries. They may look at you strangely, but as long as you’ve had a least 2 margaritas (get them “gold”), you won’t care. Appearance: ( 8 ) Creating an absolutely beautiful mess, Border’s impromptu nacho toppings present just about every color in the food rainbow. Red ripe tomatoes, subdued green guac, school bus yellow cheese sauce, and a spicy hued chili, accented by our much adored (and our nacho wild card addition) ranch sauce. Quality of toppings: ( 8 ) As always, there is debate in the quality section. One Nacho Patroler (out of the 8 of us that undertook this effort) felt that the chips were somehow different than usual. Skyler, following her lifelong pursuit to rid the world of queso dip, argued that cheese sauce is just about never welcome on a nacho. Andi countered by pointing out that Border queso is just about the best you’re going to find. Our points of consensus: the guac was fabulous and the addition of ranch sauce added a unique kick. Distribution of toppings: (9) We know how to distribute. Price: (7) making your own nachos is always an expensive venture, and this attempt is no different. Coming out at just under $15 before tax, our Fantasy Nachos yield a meal size amount of food (and calories) for about half of us with some left over. Of course, with the amount of free chips we had on our table by the end, we probably all could have filled up. It is our professional nachopinion that Border would do quite well to offer their loyal customers (namely, us) a more user friendly and a slightly less DIY nacho plate. And, as most people are wont to do after a few gold margaritas, we decided to express this opinion to the management. While our server Joshua had been very excited about our culinary creativity, the manager who came over was less than impressed. As she explained it, Border only creates original Tex-Mex food, and they couldn’t think of a way to make original nachos. In addition, with a number of restaurants like Sunset and Cambridge Common in the area making quality nachos, they didn’t want to fight for a spot in a glutted market. We call shenanigans. There is nothing original about any of the food at Border (because tacos, enchiladas, and fajitas are so original), and there is ALWAYS room for more nachos in the area. We caught more than a hint of stonewalling in her response. Get over yourself, Border. Apparently, Border’s large, prominent comment box is just for show; they clearly don’t really care what the people want. Give us nachos, or give us death!! Every time I go in there, I wish for nachos. Sometimes I’ll order a quesadilla for my meal, eat half of it, then scoop the cheese out of the other half with chips as my own DIY nachos. Good stuff!